Haque – Retrostyle Roguelike Game. I’m All In. This post is going to be about a videogame called Haque (pronounced “Hack”) that I have never played. It’s not even out yet. Despite the game not being released yet, and of course unplayed by me, I am proud to call myself a fan. Back in ye olde twentieth century, when Dave Arneson and Gary Gygax collaborated on the novel gaming concept called Dungeons and Dragons, they influenced all kinds of people to embrace the idea of wandering around in dark caverns, fighting monsters for loot, and maybe completing a heroic quest. And probably dying on the way. Sure, they didn’t invent the heroic quest, but they certainly gave purpose to the imagination of geeks everywhere. Some of those geeks made videogames. One of them was Rogue, a dungeon-crawling game with minimal graphics (this was the 80s, yo) that inspired other generations of similar games, like Hack, and Nethack. Hack (or one of the variants) was so interesting and sophisticated, other computer programs were written to play it. Boom. It’s no wonder Skynet hasn’t blown up humanity, it’s probably too busy playing one of these addictive procedurally-created dungeon games. I never played Rogue, Hack, or Nethack. But I did play Moria on my Amiga 2000, and Moria was a delve-into-the-depths kind of game like Rogue or its descendants. That got me hooked. 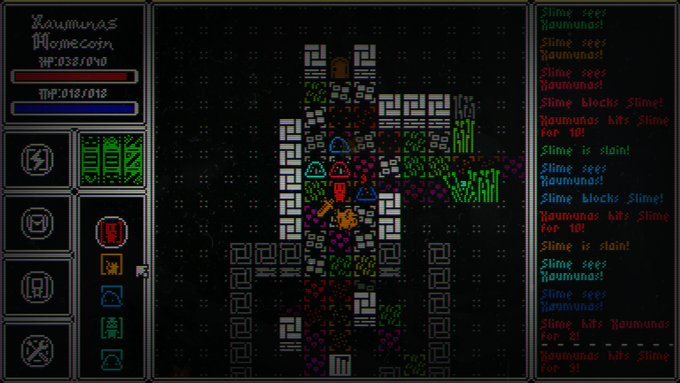 Rogue was such an archetypal game, that there are a class of games called roguelikes, which share certain characteristics with this Platonic Ideal of a Game. Arguably, Diablo and Torchlight are roguelikes, right? Yes, yes, enough of the gaming history lesson that I’m probably telling all wrong. 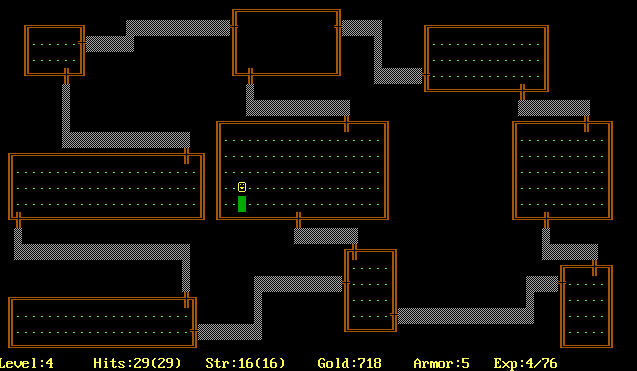 Anyway, I like roguelike games, and in general, I’m fond of an old visual style. I grew up in the last century, when we might have considered ourselves lucky to have more than two colors, or have an actual image instead of ASCII characters to represent our hero and their opponent monsters. Really? How could I not contribute to a Kickstarter that had a game with Werewolf-Eagles? And I think Werewolf-Eagle might be a playable character. Maybe I’m making that up. I could be making this all up! Don’t trust me! That’s totally an eagle. What will happen when there’s a full moon? Go check out the link to the Kickstarter, but also here are some gaming review sites that have write-ups on Haque that are probably more reliable and less “let me tell you how it was when I was playing Dungeons and Dragons. We had real dragons, and we had to walk uphill through miles of snow everyday to be chained up in a dungeon. That’s how I met your mother…” type of ramblings that I’m prone to do. Haque is planned for release on Mac, Windows, and Linux, so most everyone should be able to enjoy the game. I’m intrigued by the storyline elements that will be driving the game, the lore, the cat that follows your character and helps fight (I know Nethack had that, Moria did not) and a Random Name Generator. I love that kind of stuff. I’m in for $15, so I’ve already pre-bought the game (provided Kevin hits his modest goal of $6400), his team had previously kickstarted and delivered Project: Maiden, a nostalgic platformer game, so I believe Haque is a reasonable risk. Just look at the cute cat! Once it’s released, I’ll play the game, and give a more concrete and well-informed review. Until then, I’ll just entertain myself with some roguelike apps I have on my ancient iPod. None of the images are mine, obviously. All images were taken from the Haque Kickstarter page (I’m assuming Kevin’s cool with that) except for the Rogue screenshot, found on the Wikipedia.org entry for the game. I can’t say I’m as excited as you are – I came into games in the Early Console years, and I’ve become jaded as far as graphics. I would give this a try i fI could play it at a friend’s house, I’m chicken when it comes to downloading myself. It looks fun! I hope it thrills you! Thanks, Jen, and it’s not a problem if you’re not as excited as I am about little sprites moving around a dungeon. This post made me miss my Amiga (well, my friend’s but I played on it more!) – Zak McCracken, James Pond: Robocod and something that was particularly graphic (for the time) with a purple sock monster ripping heads off. Forget the game name though. None of which are like this game, but yeah… Retro all the way! on the Amiga, I played a lot of ELITE, which was super-low resolution graphics. The gameplay was the key, though. And Empire, a super-simple but addictive wargame. It’s a wonder I managed to get married. I slammed into the space station So Many Times. Then eventually I got the hang of it. You’re a stand-up fellow, Mister Associate Producer of The Piano Guys. I’m looking forward to talking to you about how often our Werewolf-Eagles are getting killed. I need to show my spouse this because I think it’s right up his alley. Also, they included Linux. Nobody ever thinks of the Linux users, haha. Yeah, it’s nice to see the Linux community getting games.